The EWZ records are still very new to me. I’ve been putting off accessing them for nearly a year now and finally a few weeks ago, discovered Salecker EWZ E- and G- cards that were randomly digitized by the LDS. 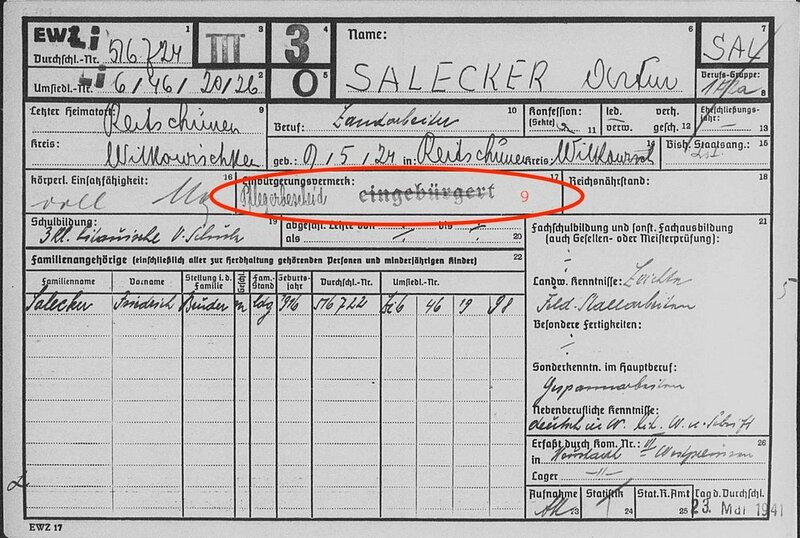 These are the children of Joseph and Marie Saleker (the brother of my great-great-grandfather Johann Andreas Heinrich “Henry” Saleker) and also included a new discovery: a daughter of another brother of Henry’s that I had never known about before. As I explained in my previous blog post, these cards are just a small part of the EWZ records on these people. But they have already provided interesting clues themselves. However, I feel that there is more on these cards than I realize—but some of these notes and abbreviations, I can’t seem to find any information about. I’ve gone through a few of the cards I have and circled things on the cards that I don’t recognize. In some cases, I’m making an educated guess, in others, I’m clueless. If you have any information, theories, or resources to help me decipher some of these things, please do send me a note through my contact link! 2. I have seen this next to the first name of several of the EWZ cards. At first, I though perhaps it was a reference to ehemann (husband) or wife (ehefrau) until I found it on the card of someone who was single. 3. I believe this refers to the groups that individuals were categorized in based on their ‘racial purity.’ In other words, how ‘German’ they were. Starting with group 1 as the ‘purest’ Germans down to group 4. It seems that Martha was originally put in group III but changed to group 2. 4. I have no idea what this could mean. 8. This note refers to several notes questioning her political reliability. However there are other notes here such as “A Fall” and “II. J” that I don’t understand. For those who may not be familiar with these, I do have (what I believe) is an idea of how these mini family trees are composed. At the top you have Vaters Vater (father’s father—Grandfather) VM (Vaters Mutter.) 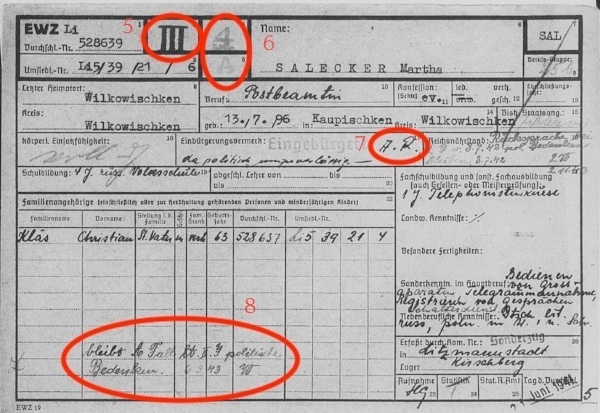 I believe the marks (which are 1’s) just designate the information on that one ancestor—but that is merely a theory. You will also see that the squares represent males and the circles female. The ones that are dotted and include both a square and a circle, were supposed to be traced with a pen depending on if the sibling was male or female. 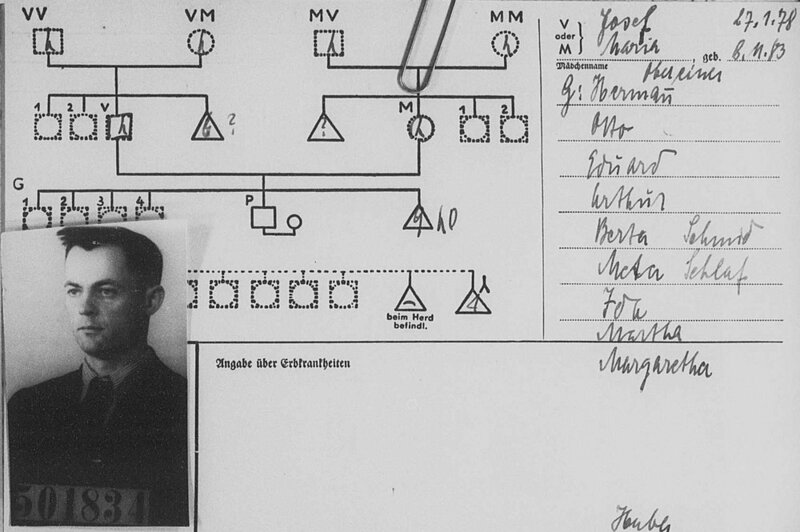 The next line (labeled ‘G’ for Geschwister—siblings) includes the individual and his brother and sisters. You can see that the triangle at the end has a 10 written next to it for all the individual’s brothers and sisters including himself. The next line is labeled ‘K’ (kinder—children) and would include this individual’s children and his wife. Which is why you see a reference to “Herd.” It appears this may also include other people in this individual’s family unit—but I’m still not clear on that. The names on the right are this individual’s siblings. 9. This was originally stamped with “eingebürgert” which means ‘naturalized.’ However, that was crossed out and “Pflegebescheid” (literally ‘care decision’) was written. I have no idea what this could mean as it relates to naturalization but I assume it has something to do with health, considering it essentially means a need of care or a nursing assessment. 10. 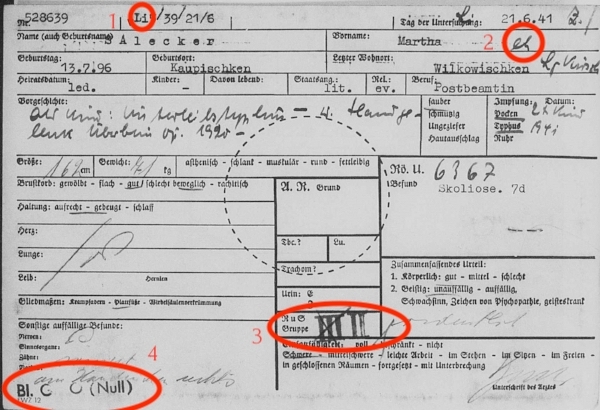 “Gehört zu” would mean “belongs to” but perhaps it says “Gehörst zu” which would mean “you are too.” Clearly the numbers correspond to his list of siblings above—perhaps it means he belongs to their ‘herd’ or family? 11. I believe that these could be camp or barracks numbers, but I’m not sure. 12. This stamp “KV” appears on almost all of these siblings E-Kartei. I am assuming it is referring to the location of their relocation but I don’t know what it stands for. If you have any other theories or comments, do feel free to reach out to me through my contact page!